The London Underground is an all-electric metro railway system that covers much of the conurbation of Greater London and some neighbouring areas. It is the world's oldest underground system, and is the largest in terms of route length. Service began on 10 January 1863 on the Metropolitan Railway; most of that initial route is now part of the Hammersmith & City Line. Despite its name, about 55% of the network is above ground. Popular local names include the Underground and, more colloquially, the Tube, in reference to the cylindrical shape of the system's deep-bore tunnels. The Underground currently serves 274 stations and runs over 408 km (253 miles) of lines. There are also a number of former stations and tunnels that are now closed. In 2004–2005, total passenger journeys reached a record level of 976 million, an average of 2.67 million per day. The nickname "the Tube" comes from the circular tube-like tunnels through which the small-profile trains travel. This photograph shows a southbound Northern Line train leaving a tunnel just north of Hendon Central station. The Metropolitan Railway, the first section of the London Underground, initially ran between Paddington (Bishop's Bridge), now just Paddington, and Farringdon Street, a temporary station just north-west of the present Farringdon station, and was the world's first urban underground passenger-carrying railway. Following delays for financial and other reasons after the railway was authorised in 1854, public traffic began on 10 January 1863. 40,000 passengers were carried that day, with trains running every ten minutes; by 1880 the expanded 'Met' was carrying 40 million passengers a year. Other lines swiftly followed, and by 1884 the Inner Circle (today's Circle Line) was complete. These early lines used steam-hauled trains, which required effective ventilation to the surface. An interesting example of this can be seen at 23-24, Leinster Gardens, W2. These houses were demolished for the construction of the then District Line between Paddington and Bayswater. However, to 'keep up appearances' in what still is a well-to-do street, a 5-foot thick concrete facade was constructed to resemble a genuine house frontage. Advances in electric traction later allowed tunnels to be deeper underground than the original cut-and-cover method allowed, and deep-level tunnel design improved, including the use of tunnelling shields. The City & South London Railway (now part of the Northern Line), the first "deep-level" line and electrically operated, opened in 1890. In the early 20th century, the presence of six independent operators running different Underground lines caused passengers substantial inconvenience; in many places passengers had to walk some distance above ground to change between lines. The costs associated with running such a system were also heavy, and as a result many companies looked to financiers who could give them the money they needed to expand into the lucrative suburbs as well as electrify the earlier steam operated lines. The most prominent of these was Charles Yerkes, an American tycoon who between 1900 and 1902 acquired the Metropolitan District Railway and the as yet unbuilt Charing Cross, Euston & Hampstead Railway (later to become part of the Northern Line). Yerkes also acquired the Great Northern & Strand Railway, the Brompton & Piccadilly Circus Railway (jointly to become the Great Northern, Piccadilly & Brompton Railway, the core of the Piccadilly Line) and the Baker Street & Waterloo Railway (to become the Bakerloo Line) to form Underground Electric Railways of London Company Ltd on 9 April 1902. That company also owned three tramway companies and went on to buy the London General Omnibus Company, creating an organisation colloquially known as the Combine. On 1 January 1913 the UERL absorbed two other independent tube lines, the C&SLR and the Central London Railway, the latter having opened an important east-west cross-city line from Bank to Shepherd's Bush on 30 July 1900. In 1933, a public corporation called the London Passenger Transport Board (LPTB) was created. The Combine and all the municipal and independent bus and tram undertakings were merged into the LPTB, an organisation that approximated in scope to TfL. It set in train a scheme for expansion of the network, the 1935–1940 New Works plan, which was to extend some lines, and to take over the operation of others from the main-line companies; however, the outbreak of World War II froze all these schemes. From mid-1940, the Blitz led to the use of many Underground stations as air-raid shelters, first on an ad hoc basis, which the authorities tried to prevent, but later with proper bunks, latrines, and catering facilities. Following the war, travel congestion continued to rise. The carefully planned Victoria Line on a diagonal northeast-southwest alignment beneath central London absorbed much of the extra traffic. The Piccadilly Line was extended to Heathrow Airport in 1977, and the Jubilee Line was opened in 1979, taking over part of the Bakerloo Line, with new tunnels between Baker Street and Charing Cross. In 1999 the Jubilee was extended to Stratford in London's East End, including the completely refurbished interchange station at Westminster, in several stages. Since January 2003, the Underground has been operated as a Public-Private Partnership (PPP), where the infrastructure and rolling stock are maintained by private companies under 30-year contracts, but it remains publicly owned and operated, by TfL. See History of the London Underground for full details. The Underground does not run 24 hours a day, because all track maintenance must be done at night - after the system closes. First trains on the network start operating shortly after 5 a.m. with the last trains running until around 1 a.m. Unlike systems such as the New York City Subway, few parts of the Underground have express tracks that would allow trains to be routed around maintenance sites. Recently, greater use has been made of weekend closures of parts of the system for scheduled engineering work. The Underground uses rolling stock built between 1960 and 1996. Stock on sub-surface lines is identified by a letter (such as A Stock, used on the Metropolitan Line), while tube stock is identified by the year in which it was designed (for example, 1996 Stock, used on the Jubilee Line). All lines are worked by a single type of stock except the District Line, which uses both C and D Stock. Two types of stock are currently being developed — 2009 Stock for the Victoria Line and S stock for the sub-surface lines, with the Metropolitan Line A Stock being replaced first. Rollout of both is expected to begin about 2009. For more information on the Underground's rolling stock, see London Underground rolling stock. The Underground usually serves 274 stations, but one station is closed temporarily: Regents Park, due to reopen in June 2007. The total above excludes Shoreditch, which is permanently closed. However, it is served by a replacement bus service until Shoreditch High Street station opens as part of the East London Line Extension. Fourteen stations are outside Greater London, of which five are beyond the M25 London Orbital motorway. See also: List of London Underground stations, Closed London Underground stations. The Underground is one of the few railways electrified on the four-rail system. In addition to the two running rails there are two rails that supply power to the trains, one outside the running rails electrified at +420 V DC, the other in the middle at -210 V, producing an overall traction supply voltage of 630 V.
The table below lists each line, the colour used to represent it on Tube maps, the date the first section opened (not necessarily under the current line name), the date it gained its current name, and the type of tunnel used. Lines on the Underground can be classified into two types: sub-surface and deep level. The sub-surface lines were dug by the cut-and-cover method, with the tracks running about 5 m below the surface. Trains on the sub-surface lines slightly exceed the standard British loading gauge. The deep-level or "tube" lines, bored using a tunnelling shield, run about 20 m below the surface (although this varies considerably), with each track in a separate tunnel lined with cast-iron rings. These tunnels can have a diameter as small as 3.56 m (11 ft 8.25 in) and the loading gauge is thus considerably smaller than on the sub-surface lines. Lines of both types usually emerge onto the surface outside the central area, except the Victoria Line, which is in tunnel except for its depot, and the very short Waterloo & City Line, which has no non-central part and no surface section. Only 45% of the Underground is in tunnel. The lack of lines south of the Thames is sometimes attributed to the geology of that area, the region being almost one large aquifer. Another reason is that during the great period of tube-building in the early 20th century south London was already well served by the efficiently-run suburban lines of the London and South Western Railway and the London, Brighton and South Coast Railway, then being electrified, which obviated Underground expansion into those areas. (Railways to the north and west could focus on long-distance traffic, and so were less interested in the suburbs.) More recently, the Docklands Light Railway, built to serve east London, has been extended to Lewisham. Of the 33 London boroughs, only Kingston, Bexley, Bromley, Sutton and Croydon - all south of the Thames - have no Underground stations. The Underground serves Waterloo, for Eurostar trains, and Heathrow Airport. The latter is slow (52 minutes nominal from Green Park via the Piccadilly Line) and often crowded, but is much cheaper than the Heathrow Express. The Underground uses TfL's Travelcard zones to calculate fares. Travelcard Zone 1 is the most central, with a boundary just beyond the Circle Line, and Zone 6 is the outermost and includes London Heathrow Airport. Stations on the Metropolitan Line outside Greater London are in special Zones A to D.
There are staffed ticket offices, some open for limited periods only, and ticket machines usable at any time. Some machines that sell a limited range of tickets accept coins only, other touch-screen machines accept coins and English (but not Northern Irish or Scottish) bank notes, and usually give change. These machines also accept major credit and debit cards: some newer machines accept cards only. Single Yes Yes Yes (on Oyster) Paper tickets are more expensive. Day Travelcard Yes No Yes The maximum daily spend on Oyster is capped at 50p below the Travelcard price. Monthly Travelcard No Yes No Requires registration. Annual Travelcard No Yes No Requires registration. Detailed information on tickets and fares is available from the Transport for London website. In addition to automatic and staffed ticket gates, the Underground is patrolled by both uniformed and plain-clothes ticket inspectors with hand-held Oyster card readers. Passengers travelling without a ticket valid for their entire journey are required to pay a £20 penalty fare or face prosecution for fare evasion. Oyster pre-pay users who have failed to 'touch in' at the start of their journey are also considered to be travelling without a valid ticket. Fare evaders can be prosecuted under the Regulation of Railways Act 1889 and can face a fine of up to £1,000 or three months' imprisonment. Escalators at Bank station on the Northern Line. Accessibility by people with mobility problems was not considered when most of the system was built, and older stations are inaccessible to disabled people. Whilst recently-built stations have been designed for accessibility, retrofitting accessibility features to old stations is prohibitively expensive and technically extremely difficult due to the design issues mentioned above. Even when escalators and lifts are already fitted, there are often further flights of steps between the lift or escalator landings and the platforms. TfL produces a map indicating which stations are accessible, and the more recent (2004) line maps indicate with a wheelchair symbol those stations that provide step-free access from street level. Step height from platform to train is up to 200 mm, and there can be a large gap between the train and curved platforms. Only the Jubilee Line Extension is completely accessible. TfL's plan is that by 2020 there should be a network of over 100 fully accessible stations. This consists of those already accessible (recently built or rebuilt, and a handful of suburban stations that happen to have level access) along with selected 'key stations', which will be rebuilt. These key stations have been chosen due to high usage, interchange potential, and geographic spread, so that up to 75% of journeys will be achievable step-free. While many stations on the surface involve a short flight of stairs to gain access from street level, virtually all underground stations use some of the system's 410 escalators (each going at a speed of 145 ft per minute, approximately 1.65 miles per hour) 112 lifts, or a combination of both. There are also some lengthy walks and further flights of steps required to gain access to the correct platform once underground. 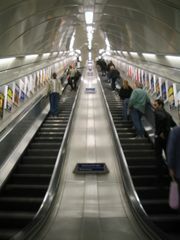 The escalators in Underground stations are among the longest in Europe and all are custom-built. They run 20 hours a day, 364 days a year and cope with 13,000 people per hour, with 95% of them operational at any one time. Convention and signage dictate that people using escalators on the Underground stand on the right-hand side, walk on the left. 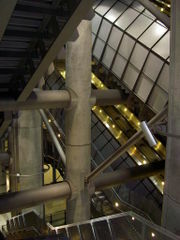 Westminster station — extensive support structures are required because Portcullis House is above. The Underground has an excellent passenger safety record. Most fatalities on the network are suicides. Most platforms at deep tube stations have pits beneath the track, originally constructed to aid drainage of water from the platforms, but they also help prevent death or serious injury when a passenger falls or jumps in front of a train. These pits are known colloquially as "suicide pits". Delays resulting from a person jumping or falling in front of a train as it pulls into a station are announced as "passenger action" or "a person under a train", and are referred to by staff as a "one under". The Jubilee Line extension is the first line to have platform edge doors. These prevent people from falling or jumping onto the tracks, although their main purpose is to contain the blast of air created by trains. The London Underground network carries almost a billion passengers a year. It is one of the safest mass transport systems in the world, with just one fatal accident for every 300 million journeys. London Underground is an important part of everyday life of hundreds of thousands of Londoners. This makes it a prime target for terrorists. Several attempts have been made to disrupt the London Underground, a number of them have succeeded in doing this. Relatively few accidents are caused by overcrowding on the platforms, and staff monitor platforms and passageways at busy times and prevent people entering the system if they become overcrowded. Camden Town station is exit-only on Sunday afternoons (13:00–17:30) for this reason, and Covent Garden has access restrictions at times due to overcrowding. Smoking was banned on all trains in July 1984. The ban was extended, for a six-month trial, to all parts of the Underground in summer 1987, and this was made permanent after the King's Cross fire in November 1987. Smoking anywhere on Underground stations and trains is punishable by a large fine. While photography for personal use is permitted in public areas of the Underground, tripods and other supports are forbidden due to the often cramped spaces and crowds found underground. Flash is also forbidden due to its potential to distract drivers and disrupt fire-detection equipment. As their effects are often similar to those of flash, bright auto-focus assist lights should also be switched off or covered up when photographing the Underground. The Underground's staff safety regimen has drawn criticism. 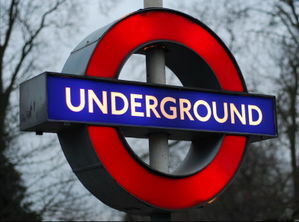 In January 2002, the Underground was fined £225,000 for breaching safety standards for workers. In court, the judge reprimanded the company for "sacrificing safety" to keep trains running "at all costs." Workers had been instructed to work in the dark with the power rails live, even during rainstorms. Several workers had received electric shocks as a result. Due to a combination of the age of the system and significant under-funding in the past, some parts of the Underground's infrastructure are substantially older than their equivalents in other cities. Recently, one of the private infrastructure companies, Tube Lines, was reported to be using eBay to find spare parts for some of its equipment because they were not available any other way. The British government has promised £16 billion of funding until 2030, with early priorities to cut delays and improve reliability, including refurbishments of lifts and escalators, more thorough cleaning and a new station serving the new Wembley Stadium. The Victoria Line will receive new signalling systems and 47 new trains, and other lines will have renewal of track and equipment. The Jubilee Line received four new trains and 59 new cars in December 2005, bringing the total to 63 seven-car sets, built by Alstom. It is also scheduled to receive £160 million for new signalling equipment from Alcatel Canada Transport Automation Solutions. The Victoria Line and sub-surface lines will receive 1,738 new cars between 2008 and 2015, to be built in Derby. The Bakerloo Line will not receive new trains until 2019, with supplementary stock likely coming from the Victoria Line. The sub-surface lines will receive 190 new trains, built by Bombardier, meaning all trains will be of the same design, giving easier maintenance. New trains will feature inter-car gangways enhancing passenger safety, and improved acceleration and braking allowing an increase in train frequency, in the case of the Victoria Line from 28 trains per hour to 33. The last trains to be replaced, 75 District Line trains, are currently receiving interim refurbishment. Westinghouse Rail Systems Ltd will continue to supply signalling equipment; 75% of control equipment has been supplied by Westinghouse. In summer, temperatures on parts of the Underground can become very uncomfortable due to its deep and poorly ventilated tube tunnels: temperatures as high as 47°C were reported in the 2006 European heat wave. Conventional air conditioning has been ruled out on the deep lines because of the lack of space for equipment on trains and the problems of dispersing the waste heat this would generate. A year-long trial of a groundwater cooling system began in June 2006 at Victoria station. If successful the trial will be extended to 30 other deep-level stations. There are posters on the Underground suggesting that passengers carry a bottle of water to help keep cool. Sub-surface tunnels are more capable of dispersing waste heat. The new S Stock trains due to be delivered from 2009 will have air-conditioning. A new station is being built on the Piccadilly Line to serve Terminal 5 of Heathrow Airport. The extension (called PiccEx) consists of a two-platform station, two sidings where trains can be stabled, approximately 3 km of 4.5 m diameter bored tunnels, a ventilation shaft and two escape shafts. Civil works for the two tunnels, the ventilation shaft, one escape shaft and the structure of T5 station have been completed and track is being installed. The junction between PiccEx and the Heathrow Loop is being constructed: this work required that the tunnel between Terminal 4 and Terminals 1,2,3 was out of service until 17 September 2006. The extension is due to open in 2008. Terminal 5 will be staffed by airport staff, trained and licensed by the Underground. Trains will run from Hatton Cross to platform 1 at Heathrow Terminals 1,2,3, thence to Terminal 5. Preparations are under way to extend the East London Line (ELL) both northwards and southwards. Shoreditch station closed in June 2006 and the line north of Whitechapel will be diverted to run on the old Broad Street viaduct - to Dalston and along the North London Line to Highbury & Islington, to provide interchange with the Victoria Line. To the south, two branches are planned, mainly using existing railway lines. The first will run to West Croydon, with a spur to Crystal Palace, the second to Clapham Junction. The extension to Clapham Junction is currently unfunded. The East London Line will therefore become a more important transport artery, and when the extension is open it will be operated as part of the London Overground, and will no longer be part of the Underground, although services will still be provided by Transport for London, and the line will almost certainly remain on the Tube map as the entire London Overground system is likely to be depicted there. If the extension to Clapham Junction is built, the London Overground system will contain the proposed 'Orbital Rail route' (see Orbirail). The Bakerloo line originally ran to Watford Junction via Watford High Street, but was cut back to Harrow & Wealdstone station in late 1982. Recently plans for the re-extension have been approved as part of TfL's plans to manage some of North London's railways. However, when the re-extension will take place has not been disclosed. TfL, together with Hertfordshire County Council, plans to connect the Watford branch of the Metropolitan Line to the disused Croxley Green National Rail branch, although it is most likely for the extension to join the branch between the abandoned Croxley Green and Watford West stations, with a new station being added at Ascot Road as a replacement for Croxley Green and Watford West being heavily refurbished. This will bring the Underground back to central Watford and the important main line station of Watford Junction. If this happens the current Watford (Metropolitan) station will close. TfL as well as Waltham Forest have proposed to link Walthamstow Central station with Walthamstow Queens Road railway station via varying paths or using a subway. This will mean better interchange between the two stations. TfL's Tube map ( pdf) and " roundel" logo are instantly recognisable by any Londoner, almost any Briton, and many people around the world. The original maps were often street-maps with the location of the lines superimposed, and the stylised Tube map evolved from a design by electrical engineer Harry Beck in 1931. 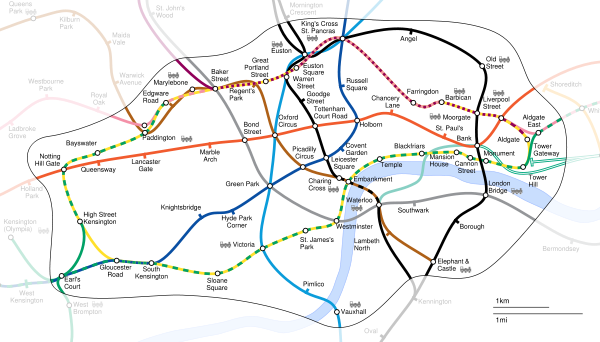 See Tube map for an in-depth analysis of its history and its topological nature. The map has been such a successful concept that virtually every major urban rail system in the world now has a map in a similar stylised layout. Many bus companies have also adopted the concept. The origins of the roundel, in earlier years known as the 'bulls-eye' or 'target', are more obscure. While the first use of a roundel in a London transport context was the 19th-century symbol of the London General Omnibus Company — a wheel with a bar across the centre bearing the word GENERAL — its usage on the Underground stems from the decision in 1908 to find a more obvious way of highlighting station names on platforms. The red disc with blue name bar was quickly adopted, with the word "UNDERGROUND" across the bar, as an early corporate identity. The logo was modified by Edward Johnston in 1919. Each station displays the Underground roundel, often containing the station's name in the central bar, at entrances and repeatedly along the platform, so that the name can easily be seen by passengers on arriving trains. In addition, some stations' walls are decorated in tile motifs unique to that station, such as profiles of Sherlock Holmes's head at Baker Street, and a cross containing a crown at King's Cross St Pancras. Edward Johnston designed TfL's distinctive sans-serif typeface, in 1916. A version of the typeface, modified to include lower case, continues in use today, and is called " New Johnston". The new typeface is noted for the curl at the bottom of the minuscule l, which other sans-serif typefaces have discarded, and for the diamond-shaped tittle on the minuscule i and j, whose shape also appears in the full stop, and is the origin of other punctuation marks in the face. TfL owns the copyright to and exercises control over the New Johnston typeface, but a close approximation of the face exists in the TrueType computer font Paddington. TfL takes legal action against unauthorised use of its trademarks and of the Tube map, in spite of which unauthorised copies of the logo continue to crop up worldwide. Official ranges of clothing and other accessories featuring TfL's graphic elements are available. London Underground sponsors and contributes to the arts via its Platform for Art and Poems on the Underground projects. Poster and billboard space (and in the case of Gloucester Road tube station, an entire disused platform) is given over to artwork and poetry to "create an environment for positive impact and to enhance and enrich the journeys of ... passengers".